The last ten minutes of last week's episode, Out of Time, dropped some major show-altering bombs only to be undone by Barry's sudden time warp to the beginning. With The Flash starting as the last episode began Barry has the chance to save Central City from a humongous tidal wave and finally make Iris his with the knowledge he learned before the time rip. As expected, things don't go as planned especially when the rogues hit town. No passionate kiss with Iris on the precipice of a tsunami created by the Weather Wizard. No dead Cisco at the hands of a murderous Dr. Wells once discovered to be the Reverse Flash. No identity reveal to Iris and her feelings for Barry. No paralyzing injury to Captain Singh. It's like it never ever happened. But that was to be expected with Barry going back in time and seeing himself running alongside himself. Time travel is part of The Flash's canon and a crucial part of his rivalry with Reverse Flash and Professor Zoom. With Dr.Wells' revelations last week time travel is ingrained in the story. The only thing is that doing the right thing isn't as much fun as seeing things fall apart. Even Cisco's death, while heartbreaking, was a shocking twist that drew on emotions. Would I rather have Cisco die? No, but those feels I can never unfeel again. There's an investment with these characters that the show does a fantastic job of making them likable and relatable. Captain Cold, who returns with Heat Wave and little sister Lisa, has a villainous charm that makes him so watchable. And yet, Cisco tugged at my heartstrings again with being forced to reveal Barry's identity after the rogues kidnapped him and his jerk brother Dante (Nicholas Gonzalez). Wentworth Miller and Dominic Purcell look like they're having a blast playing the rogues. Miller's tongue-in-cheek banter is appropriately cool and calm while Purcell's wilder pyrotechnic is an amusing contrast. Prison Break was never this much fun. It's also a nice touch that the show follows classic Flash comics and cartoons where there's a mutual respect between Flash and his adversaries. Peyton List as Lisa Snart wasn't given a lot to do, but she was way more playful than her former Tomorrow People role as the steely Cara. The unrequited love story has been one of the weakest on the show and it became rather awkward when Barry, thinking Iris' feelings for him remained without the threat of a man-made disaster, was none too pleased as she reiterated to him she's with Eddie. What does Barry get for his troubles? A break-up with Linda and a punch in the face from Eddie. I'll be so happy when Iris does make her true feelings known so we can get past this nonsense. 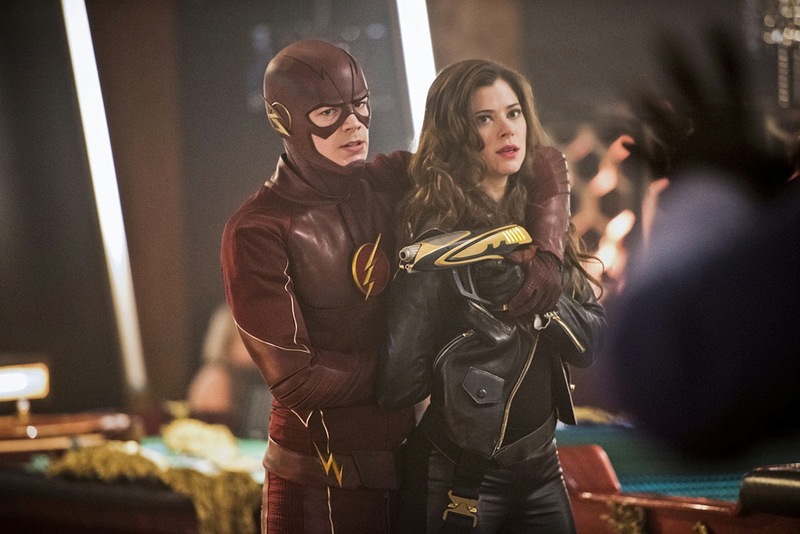 What would an episode be without Harrison Wells phasing his arm through someone? With the timeline altered, Wells had to kill someone and who better than the nosy reporter, Mason Bridge? If there's one thing Wells covets it's his secrets. So he can't allow Bridge to continue to snoop around and put the pieces together that he killed Stagg. It's a rather striking scene as he tosses Bridge around the news room before pulling his version of the Alien stomach burst trick. Kidnapped Ramon brothers reconcile, Wells tells Cisco how much he values him (without killing him this time), and Barry gets rejected by Iris a second time made 'Rogue Time' a mixed bag of emotions and somber feelings. The good news is Mark Hamill as the Trickster will be causing some havoc next week and with it some much needed fun.